Johannesburg, South Africa – It is just over half way through 2015 and EFC is running at full steam ahead. With some major plans for future events, there are already massive cards in the coming months for fans to prepare for as excitement begins to flair in anticipation. These are the next three major events to look out for including some info about the main events featured at each. After a gruelling four fight undefeated win streak, the enigmatic Cedric Doyle has solidified his placed at the top of the rankings and has earned himself the opportunity to fight for EFC gold. In his way, at Carnival City in Johannesburg stands the most dominant champion in EFC history, Demarte `The Wolf` Pena. The battle for divisional power ensues as the former welterweight champion Michiel Opperman and the dangerous ground and pound specialist Liam Cleland go head-to-head in the final contest for the vacant EFC middleweight title. Plus Durban`s Wesley Hawkey steps into the hexagon to face the electrifying Tumisang Madiba. The heavyweight division sees the return of the hard hitting Bernado Mikixi as he takes on tough as nails Danie van Heerden and the controversial Mark Hulme faces off with the undefeated Lyle ‘Krusher’ Karam in a war between gyms FFM and CIT. Recently announced, DRC born and undefeated Champion Dalcha will challenge the most polarizing figure in EFC, Norman ‘Chef’ Wessels, for the light heavyweight belt. These titans will go head-to-head in in front of Dalcha’s home turf and home fans in what will be a war of epic proportions. Gideon ‘Juggernaut’ Drotschie seeks his redemption for past performance when he welcomes Belgium’s Marc Vlieger to the EFC Hexagon. And the American Dave ‘Pain Train’ Mazany is back and wants to take gold, but standing in is way to the title is former contender Sibusiso ‘The Monster’ Mdoko. Plus Matthew Buirski answers Scotland’s Danny Henry’s callout in a featherweight clash that could lead to a number one contender position. EFC makes its third turn towards the warm coastal city of Durban, headlined by the title fight between welterweight champion David Buirski and home town hero Martin ‘The Punisher’ van Staden. Will Durban witness history with Buirski becoming the first man to conquer the dreaded curse or will van Staden reign supreme in his home-town? Plus, to be announced soon when details are finalised, another huge title fight to be added to EFC 43, including the return of Durban’s Amanda ‘Mad Dog’ Lino, set to make history on an EFC main card. All this and so much more is coming up soon. 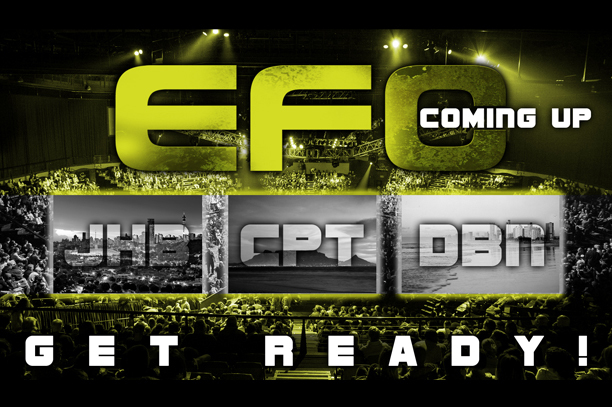 All EFC events brought to you by BetXchange.com. Tickets available at www.computicket.com, get them now!